DYK: Quick Start had a favorite files section? I didn't realize that Quick Start had a favorite files section. 1. Select Recent Files in the large box to the left. This filters what you see in the right hand box. 2. Select a file in the list on the right that you want to add to your favorites list. 3. Click the Add to Favorites button in the bottom right corner of the dialog box. The file appears in the Favorite Files (local) or Favorite Files (remote) list based on your storage selection. This is only available via Quick Start (oddly enough) and you have to choose New Database to get Quick Start up to pick an already existing favorite database. 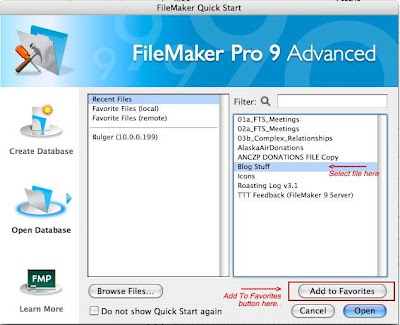 All in all, pretty cool though and perhaps a favorites idea of FileMaker files might migrate out to the standard FileMaker menus sometime? Older PostDYK: How To Turn Quick Start Back On?